Bonbons Bakery is an Australian & International food franchise brand, with retail stores specialising in 'Grab & Go' Asian & Western style freshly baked bread based products, hot & cold beverages and cakes & treats. The business model revolves around an "East Meets West" theme, where traditional Asian and European recipes are blended together, with a focus on both product integrity ("baked fresh" & "quality coffees") and price value ("lunch for under $5") which has appeal to consumers who are looking for a quick snack, a quick treat, or a quality takeaway coffee, and want to know that they are getting great value for their money. 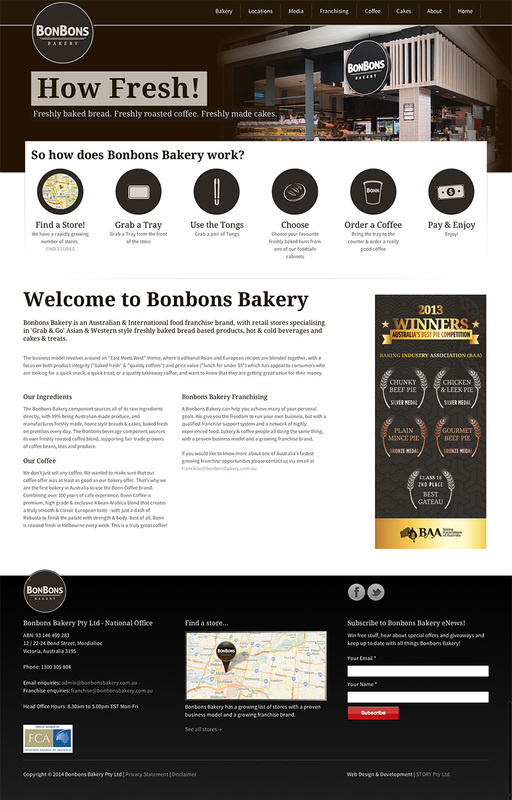 The Story Group built a fully responsive site that is fully managed by staff at Bonbons via an easy to use content management system. As new stores are opened by Bonbons (they have over 20 stores currently) locations can be easily added to the website and the location map via the content management system with just a couple of clicks. The Bonbons site was built with the aid of the Zurb Foundation Framework (a responsive framework for moile ready websites) and is featured in their gallery.